See, Jenny, you just have to keep drinking, then you don’t think as much. Of course, then I wouldn’t have something so interesting to read. Libby (aka Miss. Polly Peachum)! What a surprise! Thank you for reading. The wonders of the internet! I am rarely admonished to drink more, but I will try. What a juxtaposition of horse and rider, city and catastrophe, past and present. I, like Libby above, want you to distract yourself from too much thought: go back to du Monde’s, have more bignets, ride to the top of that big building down by the Big River, and contemplate Huckleberry Finn and Jim (just as a barge tries to make the turn). As you see, I share your penchant for daydreaming. Thank you for the suggestions. It is a wonderful thing when instruction is such a delight to follow! On your recommendation, I set aside time to consider Huck and Jim before setting out for the airport today, but Natchez was impossible as I was in NOLA for work, not vacation. Hope you are still enjoying yourself in the southwest. I enjoy your posts, so don’t confuse my comments with any disatisfaction with the form. I find New Orleans to be repulsive in a Babylon sort of way. Maybe I should drink more when I’m there (will that take me closer to the ‘real’ NO?). My mother worked near New Orleans after Katrina and found racism thriving – in the face of ‘relief’ (that is, while handing out the Government’s money). Well, Mr. C, I appreciate New Orleans for its distinctive character in a (more and more) homogenized America. Additional Hurricanes (the drink, that is) will not, I think, bring you over to my way of thinking. But, do you like jazz? Your comments about what your mother observed in the wake of Katrina are VERY interesting to me. I hope you will elaborate. This morning, before I came to your place, my wife and I were thinking about going to Louisiana at the beginning of September. Your post comes at the right time. We are planning to fly in and rent a car out there. Is it advisable for over 70 people, in age not number.? Sounds lovely. Though (as I’m sure you’re aware), it will be very warm in early September. For me (weary of our long Northern winters), that is a plus. As for renting a car and driving, I imagine it will be fine. Before one of my children jumps in to mock me, I should add, however, that I, myself, learned to drive well into adulthood and have never dared to get behind the wheel in unfamiliar territory. I just have a feeling that you and your wife don’t suffer from the same meshugas. If you do make the trip, I hope your blog will reflect it! Québec winters also make for southern climes lovers. AS for driving in foreign territories, we are familiar with that. The only place I felt insecure was in Washington, D.C., those guys drive like mad. We are at the soon to visit a travel agency phase. I sure will blog about it when we come back. Trip planned after 9th September but have to be back before 20th. You might end up thinking MORE, and more INTERESTINGLY. 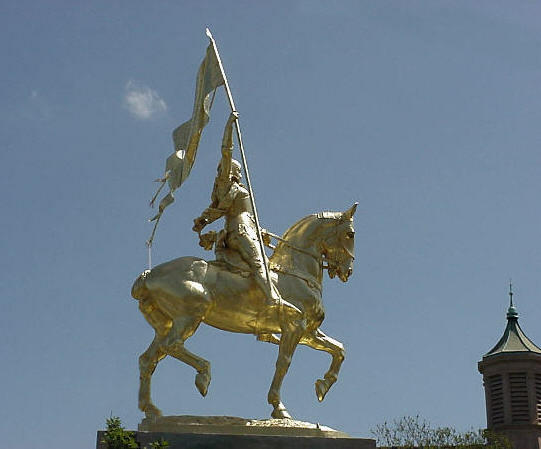 Philosophizing about rider statues is just the sort of thing we need more of. Napoleon crossing the Alps on, of course, a rearing steed. 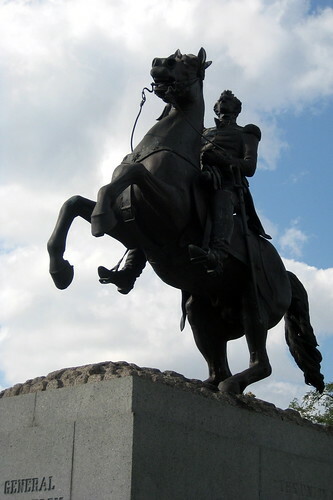 Not far from Andrew Jackson in New Orleans is an equestrian statue of everyone’s beloved Joan of Arc (http://www.doyletics.com/arj/jeandarc.jpg). Her horse plods forward stolidly, one front hoof and one rear hoof raised, but (evidently) lacking the necessary spirit to assume a rearing posture. No heroines on rearing steeds–that would violate more than natural horse movement. Oh good god, Andreas. It’s OK to have a cool drink while on vacation and ponder statues and statutes. I too, am an amateur artist and spent many days drawing and painting horses, riding and cleaning up after horses. 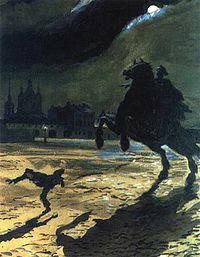 One thing I have observed in many oil paintings is the disproportion of rider to horse. The riders often look too big. In Santa Fe, the horse is perhaps the most often painted image. In Native American scenes, the horses were usually ponies, so the riders seemed unusually large. I’m glad I’m not the only one who finds parallels with literature in modern events–I’m glad you shared this one. Usually I just get weird looks! Yes, indeed! I saw a kinship as soon as I read your Gogolian story. Weird looks and rolling eyes are the cross we bear. What can you do? If we do not perform this important public service, the world may not recognize its many literary layers. Elegant post. And what a talented translation of EO! How did you happen to come across it? PS Had no idea that you and Alexander Sergeevich were on a first-name basis. M: At Arzamas we’re all on a first-name basis. Vasya Zhukovsky sends his best, says you’re late with membership dues. Love your collage, Jenny, of your margarita moments! Where oh where has Parasha gone? As P-kin’s old man in the Gypsies says, “What has been cannot be again.” I like Thomas’s comment, for I wonder which comes first–the history (whoever’s version) or the art. Perhaps it’s in a different vein, but my monumentally best friend, Roman, was in NO, cleaning up in one of those suits of can’t-touch-that, pulling out bodies of folks, the scrawny and the hefty, dogs, cats, and cows. Ugly, for sure. He said the trick was to try to get the body into a bag without all of its innards falling all over because of disintegration. Later, when the workers (brown people who spoke Spanish) cleaned up and went to a fast food joint for chicken, they were refused service. Some things we try to bury decently, but contamination resurfaces. Jenny, you always bring light, even if it’s to see what we don’t want to see; if we’re offended by seeing the rearing horse’s testicles, we can always move to different bench to contemplate how we’ll do better next time. Lynda, last night I read your comments about Roman’s experiences in NOLA and I was stopped in my tracks. I couldn’t think of what to say in response. I still can’t. It’s horrific. Thank you for reading and writing. This is my favorite method of “doing” history: rhizomatic associations, following the clash of coincidences between past and present. Thanks Jenny! Jena, rhizomatic is now my new favorite word. Thanks! Your presence is requested at Richard’s place to comment on the latest Jane Austen parody. We are all waiting for your kind reply. the title of your blog is perfect! it seems to fit both your creative process and writing style. cheri and jenny – the mutual admiration club must continue, even expand.it has brought me much enjoyment to see cheri so animated and jenny start her own blog. instead of a contest, boo, hiss, i would like to suggest a mutual homage in blog form. would it be possible for you each to write one entry in the others style? this would be a challenge and amazing to read! Thanks, Daphna. The sweat is reality; the sprezzatura is aspirational. but i’m going to push it! jenny, cheri, “would you be willing to write one entry in the others style” as an homage? And, actually, allow me to push a bit too: Where is your blog??? thank you for nudging… but you are nudging in the wrong direction. i am far too busy being a pin cushion for doctors and a test dummy for pharmaceuticals. would you be interested in the very part-time position of “official nudger”? there’s an opening. @daphna–I am happy to nudge in any direction at any time. Hang in there.